America has sadly suffered the deadliest mass shooting in its history. Officials have confirmed that 50 people are dead and 53 people are in hospital. The shooting eclipses the 32 people killed in 2007 at Virginia Tech by Seung-Hui Cho. However, this latest attack wasn’t simply against Americans. It was specifically at the LGBT community. 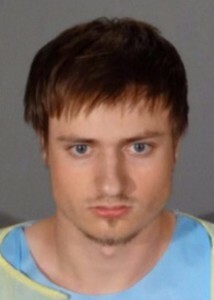 Police arrested a second man, James Howell, whom was armed with 3 assault rifles, with the suspected aim of enacting a mass shooting at the LA Gay Pride Parade. The fact that on the same day there were two shooters, unrelated, but with the same motive of aiming to enact shocking mass murders on the LGBT communities. These two incidents, one successful and unsuccessful should prove that homophobia is a serious issue that is sadly on the rise. An issue not perpetrated by one religion or demographic. James Howell told police he wanted to “harm” the gay pride parade in Los Angeles. 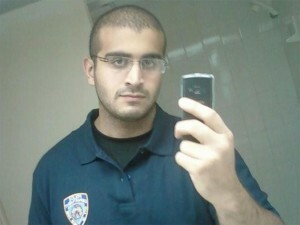 Police have identified Omar Mateen, 29, US citizen as the shooter in a suspected ‘terrorist’ attack on Pulse Gay Night club, Orlando, Florida- in the early hours of Sunday 12th June. Police are unsure about whether he had connections to ISIS/Daesh; however, they believe he had ‘leanings’ towards the group or their ideology of extremism. However, The Telegraph has reported he Mateen pledged allegiance to Isil. Orlando Mayor Buddy Dyer said he has asked the governor to declare the shooting, which coincided with gay pride month in the US, “a state of emergency”. The Independent has reported, that the ‘gunman was killed in a shootout with armed officers at around 5am on Sunday morning, US time. He was armed with an assault-type rifle, a handgun and some sort of “suspicious device”, police said. CNN identified the suspect and the Washington Post has reported Mateen’s family helped to identify Mateen. Mateen is not believed to have had any previous criminal records. However, it is reported he was on a police watch list for other activity. Mateen’s father has said his son was ‘angry’ after seeing two men kissing. 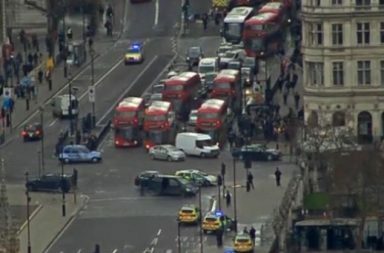 Could the police have predicted this attack? In 2015, Vocativ, suggested that there was likely to be a rise in homophobic attacks after The Supreme Court case Obergefell v. Hodges legalised gay marriage. Although, American has a significantly larger population to England and Wales;, their reported figures for Hate Crimes in 2015 were only 5,928. Vocativ reports that the statistics for American hate crimes towards the LGBT community could be up to 40 times higher than the reported FBI figure. For instance, the Bureau of Justice Statistics has come up with a much higher figure by using questionnaires instead of police reports. This under reporting could be due to people being less likely to report attacks in states where they believe the police force won’t be sympathetic to the victims and the crime committed against them. 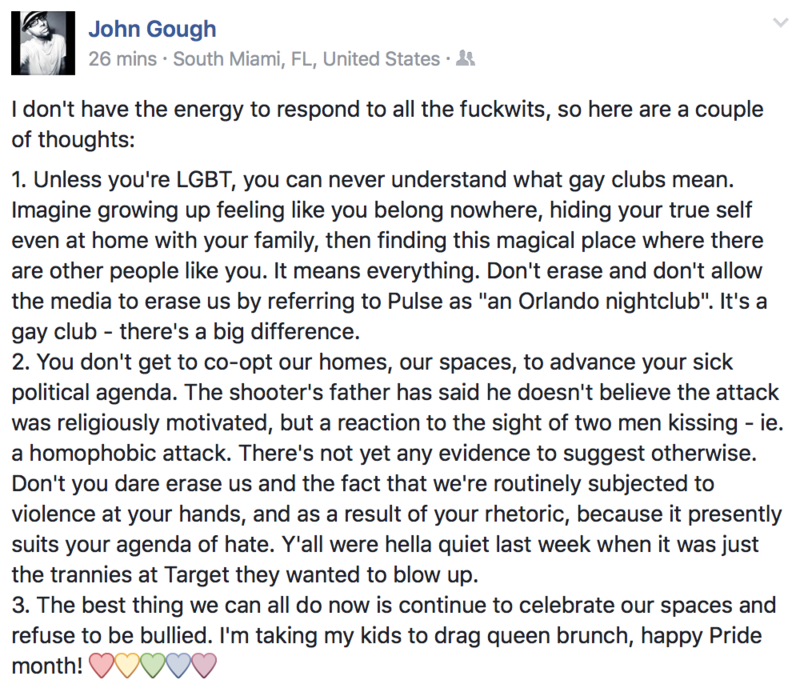 This lack of empathy is the reason why gay night clubs exist. They are considered a safe place where the LGBT community shouldn’t have to fear the judgement or violence from ignorant, intolerant or extreme people. Sadly, this security has been stolen from them. 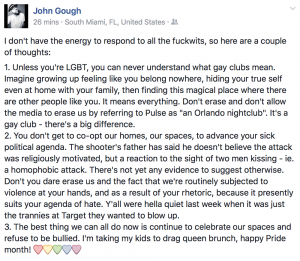 However, many in the LGBT community have decided to not live in fear; as show by the Facebook status and tweet from John Gough. We can’t afford to let them win. Don’t be afraid. Happy Pride month. Homophobia is not exclusive to one religion, nation or people. As many in the LGBT community has stated on social media, they have received hate and threats from the whole spectrum of society. However, I foresee that those whom are anti-gay marriage and homophobic will still hypocritical post condolences. Yet, each one of those people must look at their statements and whether they contribute to this growing atmosphere of hate. Thus, this is another battle that society must fight together, in order to keep everyone safe. No one should live in fear. #devastated by the #Orlando shooting. So angry w. #politicians & #churches that foster hate of the #LGBTQ community. This is on them. With that said, all mass shootings in USA should make the American people question their relationship with firearms. As Dylan Roof’s mass shooting terrorist attack, It was nearly a year ago on June 15th, that 9 Black people were murdered in Charleston, showing that attacks of terror are not exclusive to Islamic extremists. 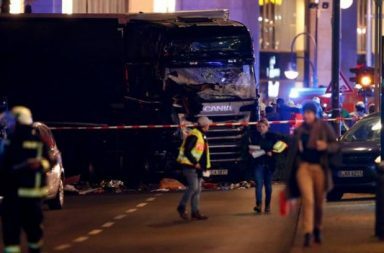 Whatever, the motivation of this latest tragic attack, what is true is that sadly 50 people at least won’t be going home to their family and loved ones. There are no excuses for hate crimes of any type. This mother shares her fear that her son was one of the victims. She ends with denouncing assault rifle ownership, hopes for a future where all people can come together and no one else has to join the mothers and fathers whom mourn after their children are the next victims of gun crime. The White house has reported 4 million people have died in gun related deaths in America in the last 10 years. Have you or someone you know experienced a hate crime? Would you feel comfortable talking to the police in your area? How Do Boxers Win Fights: Solitary Fitness Vs Team Spirit?